Samyang Optics Co., Ltd. is a lens maker in Masan (Korea), established in 1972. It made several lenses for other companies' brands. Its 500mm manual focus mirror lenses were widespread, sold under several brands and badged "Made in Korea". 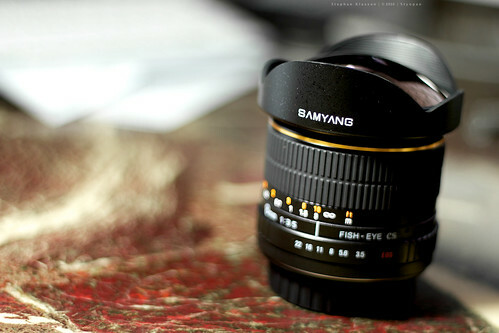 All Sears lenses "Made in Korea" were made by Samyang. German distributor Foto Walser's "Walimex, made in Korea" lenses are also Samyang products. In the USA Samyang lenses are branded Rokinon, marketed by the agency EBI. Among its lenses were many for MF and AF lens mounts of Nikon, Canon, Minolta and Yashica. Samyang offered manual focus tele lenses, mirror lenses and tele zoom lenses for the T-mount, as well as its SCV series of lenses for survey cameras. In 2004 it was merged with the Japanese CCTV optical devices maker Seikou. In 2008 Samyang moved into the market for high-quality SLR lenses by offering an 85mm f/1.4 portrait lens, soon followed by a fisheye lens, the Samyang 8mm 1:3.5 Fish-Eye SI. In September 2009, Samyang announced a 14mm F/2.8 IF ED MC Aspherical lens in mounts for Canon, Nikon, Sony, and Pentax. The lens will be compatible with both full-frame and 1.6x crop sensors. Samyang is maker of a whole series of extra-fast lenses for 35mm and APS-C format DSLRs. Samyang 16mm f/2.0 ED AS CS UMC <== only APS-C !!! Another specialty were cheap old-style long-focus lenses with fixed aperture.